Who Can Bring a Wrongful Death Action? - Giometti & Mereness, P.C. Home > Wrongful Death > Who Can Bring a Wrongful Death Action? Wrongful death actions involve a host of complex issues that can affect a variety of people. In these difficult cases, which often involve substantial damages and insurance coverage disputes, it is crucial to have an experienced attorney for advice and representation. At Giometti & Mereness P.C. in Denver, Colorado, we have decades of experience in fighting for the rights of our clients. within the first year: A spouse has the exclusive right to bring a wrongful death action in the first year. Any heirs of the deceased can join only with spousal consent. If there is no spouse, heirs can bring an action immediately. within the first two years: The spouse or an heir can file a wrongful death action in the second year. after two years: The statute of limitations bars any wrongful death actions after two years. within a year or less: Non-claim provisions in the probate code may bar an action against a deceased at-fault party’s estate, except for available liability insurance proceeds. Who Gets to Recover the Proceeds of a Wrongful Death Action? Even unnamed heirs may be entitled to recover a portion of the proceeds of a wrongful death action. Where parents are the persons with standing to bring a wrongful death action, the interests of both parents need to be taken into account before a claim can be resolved. Get an informed perspective about this area by speaking with one of our lawyers. 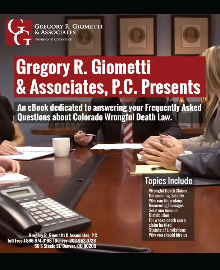 We are well-versed in Colorado’s probate laws relating to wrongful death claims. We will take the necessary steps to protect your rights in wrongful death actions involving multiple parties. To learn more, call or e-mail us for an appointment. Visit our information center on wrongful death actions to read more.